As the climax of the Sinfonia Chorale's 40th Anniversary Year in 2006 (and to fulfill the Chairman's dream) nearly two thirds of the Choir Members, together with some spouses and partners travelled with Richard Roddis to Tuscany in October 2006 to sing in some of its wonderful cathedrals and churches. Our programme was a shortened version of that for the Autumn Concert: parts of Palestrina's Missa Brevis and Pizzetti's Requiem Mass, together with motets by Byrd, Harris and Leighton. The 9 pm concert at the church of The little church of Santa Maria dei Ricci in Florence proved to be one of the highlights of the tour. The little church had filled up with an international audience (we had produced programmes in Italian and English, but were asked for French) together with the verger and his dog. As we began to sing we found that the acoustic was wonderful - we could do anything - the music almost sang itself. The door of the church was left open and as people promenaded past in the street, we saw them stop, listen and come forward into the church to sit down. Others stood at the back. At the end it was clear that everyone had shared the experience of something special. An American told us to come back next year and sing in Rome. A vicar from Holland said that he was coming to England and would come to hear us. We returned to our hotel elated. 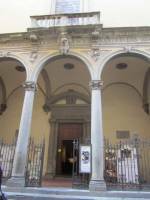 A note to tell you that the concert you gave in Santa Maria dei Ricci in Firenze was the musical highlight of my seven weeks in Italia. I loved your feeling for Palestrina and Byrd, and the Pizzetti, with which I was unfamiliar, wowed me. Keep up the good work. I'll watch for your next tour. I sent a note from your website to congratulate the whole choir for the wonderful performance they gave on Sunday night in Firenze. To you I can only say "Bravo". Your coaching, directing, and programming are fantastic. 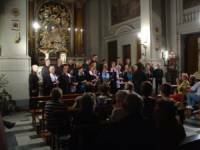 The choir got the most enthusiastic response from any audience at the two dozen or so musical events I attended in my six or seven weeks in Italy this fall. And it deserved it.